Custom Makeup Bags, Handbags, Totes etc with different Logo, Color, Materials for Promotional. Wholesale Cosmetic Bags, Handbags, Totes Bag, etc, from Stock. Cheap Cost for Whole Sale. 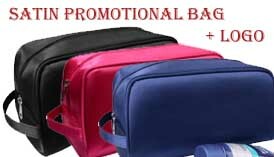 Promotional Makeup Bags, Totes etc, for different industrial needs. We started bag export business since 1994, and run own bag factory for Manufacturing since 2000. We supplier cost-effective yet stylish, an extensive range of bags & Purses, including Cosmetic Bags, Makeup Bag & Toilet Bags, Handbags & Purses, Tote Bag & Shopping Bags, also Travel Bags & kits, Backpacks etc. By those years' Manufacturing experiences, Kinmart supply hundreds different cheap-cost Bags & Designs that are available to futher Custom Made with Personalized Brands, Monogrammed Logos as Promotional Bags for worldwide Clients such as L'Oréal, Lancôme, SHISEIDO, AVON, Vichy whom from beauty, perfumery and cosmetic companies line; or like Coca Cola, Carlsberg, KFC from food industrial companies, some even from Office, banking and tourism industries. Basing on our keep-updating fabrics, materials & accessories, Clients can utilize our online Customization Function to customize the existing bags with different Fabrics, Color, Zipper, etc., as well as to personalize with their Logo, Brands to create new personal Bags. Try it now! Our designed bags are so warmly welcome by Hight End Stores, Shops, Chain Store, Hypermarkets. To meet the increasing demand of clients whom require immediate shipment yet in small quantity, we always stock thousands pieces of best saleable Cheap Handbags, Totes & Cosmetic Bags, wholesale-able at any time with a very small minimum order quantity required. Also we stock many fabrics that enable us to quickly turn out within short delivery time. Check us with email now. We are happy that more and more Clients love to buy directly from experienced Bag Manufacturing Factory & Bag Wholesaler like us! So when to choose a right Bag Manufacturer or Bag Wholesaler, choose Kinmart!